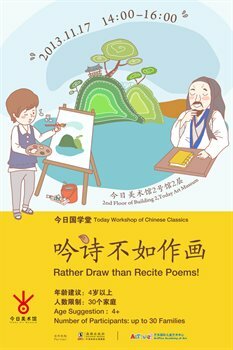 TODAY ART MUSEUM | Today Workshop of Chinese Classics/ Rather Draw than Recite Poems! Today Workshop of Chinese Classics/ Rather Draw than Recite Poems! Parents force me to recite poems every day. It is so boring. I don’t even understand what they mean! Drawing is more fun! I can draw whatever I like! But mom and dad cannot recognize what I draw and I have to explain a lot. Hey! Wouldn’t it be wonderful if drawing could be done together with poems recitation? Maybe I could make a poem then! What did you say? Some one already did that? 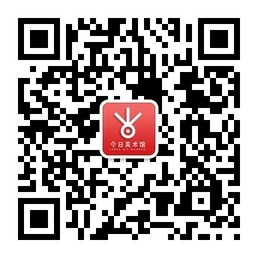 Hundred years ago there was a man called Tao Yuanming in Jin Dynasty who could achieve "painting in the poem". And he is coming with a time machine and teach me poem recitation and drawing at Today Art Museum? Well, what are we still waiting for? Let’s go to Today Art Museum! Maybe I can even go back to Jin Dynasty with the old man Tao Yuanming with his time machine!